In early December, I learned Portland Brewing Co. received label approval for a few beers. What makes this interesting is the fact that MacTarnahan's replaced the Portland Brewing Co. brand over a decade ago. The brewery was originally called Portland Brewing Co. When was the name changed to MacTarnahan's and why? Ryan Daley: The name changed around 2002. Since I was not there at the time I cannot entirely answer why the change was made. But certainly with “Mac” MacTarnahan being such a key figure in the company at the time and the success of Mac’s Amber Ale the name MacTarnahan’s was well recognized as a big part of Portland Brewing. 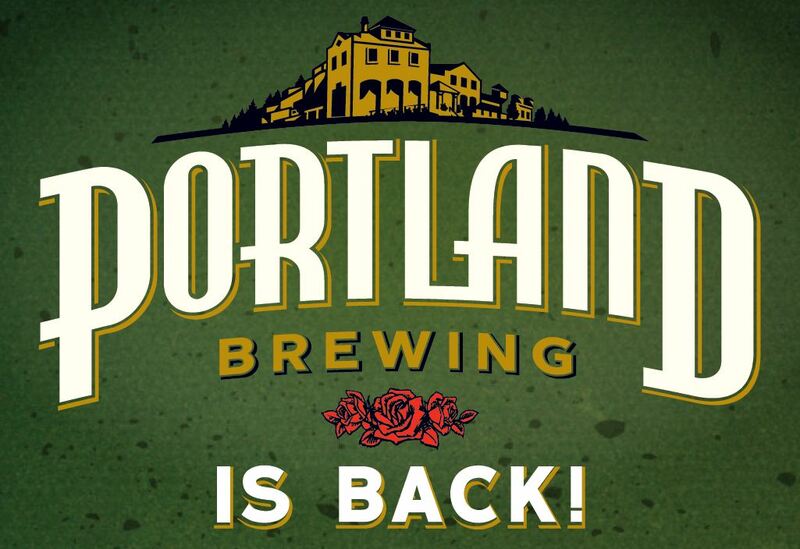 Why is the name changing back to Portland Brewing Co? RD: We wanted to get back to what the company stood for when it first opened and rebuild the connection to the city of Portland. Portland is known for so many great things, and great beer is one of them. We want to be able to help celebrate that love of great beer and get back to bringing out a good range of brews for the people of Portland to enjoy. What is the distribution region for Portland Brewing? Is the brewery's distribution footprint changing with the rebranding? RD: The majority of the existing Portland Brewing business is in Oregon, but also expands into some neighboring states. We are looking to bring select Portland Brewing beers to new markets in the new year. Where will the beer be brewed? RD: The beer will be brewed in Portland, Oregon. Besides the name change, what other changes can consumers expect with regards to the beer? RD: New beers. We are excited to brew up some new beers in 2013, and starting in the spring alone we have three new brews coming out. An IPA, made with 5 different hops; a new spring seasonal Rose Hip Gold, a Belgian-style ale brewed with rose hips; and an Oyster Stout, which is the first brew in a new local Oregon draft series. And then we will look to keep new beers coming for the following seasons. How is the rebranding of Pyramid coming along? Is it similar to what you are trying to achieve with Portland Brewing? RD: We are happy with the changes made to Pyramid. It was a situation where some of the previous decisions made were not ideal, but it was good to get back to a place that embodied the great things that Pyramid stood for since its first days in Kalama, WA in 1984. And that meant we got to get back to brewing up new beers and exploring some different styles. In terms of looking to achieve something similar with Portland Brewing, I would say it is similar in the way that we just want to be true to how these companies were founded, and at the heart of what we want to do is get back to brewing up new beers for beer lovers to enjoy. North American Breweries (parent of Portland Brewing, Pyramid, and Magic Hat) was purchased by Cerveceria Costa Rica. Where are decisions made with regards to Portland Brewing beer? RD: No changes have been made. What we are doing on Portland Brewing was decided on long before any changes in ownership, and the people that have been brewing and working on Portland Brewing for the last few years are the same people that will be doing so moving forward. Thanks to Ryan for taking the time to chat! NAB did a good job of reinvigorating Pyramid last year. It'll be interesting to see how things take shape with Portland Brewing Co.
PORTLAND, OR— An exciting change for Portland’s beer scene is quickly taking shape. The company that brews the beloved MacTarnahan’s Amber Ale and other craft beers is going back to its original name and will once again operate as Portland Brewing Company, beginning in February 2013. Portland Brewing Company was a pioneer of the Portland craft beer movement, dating back to 1986 when the company was founded by Fred Bowman and Art Larrance, high school friends whose dream it was to start their own brewery. Since opening its doors in January of 1986, Portland Brewing Company quickly evolved and grew. 1992 saw the introduction of MacTarnahan’s Amber Ale – the company’s flagship and most popular brew to this day. In 1998, Robert “Mac” MacTarnahan, a shareholder in the group, purchased the debt of Portland Brewing Company. To honor this, Portland Brewing Company developed MacTarnahan’s branded labels. In 2004, Pyramid Breweries purchased Portland Brewing Company, and the company has operated as MacTarnahan’s Brewing Company since that time. · The MacTarnahan’s name: Portland Brewing Company will continue to produce MacTarnahan’s Amber Ale as its flagship brew. The recipe will remain the same. A true Portland original, it will be brewed with the same great quality and taste that it has been since 1992. · Beer: Consumers will see old favorites like Mac’s Amber Ale and new brews from Portland Brewing Company. Seasonal, year-round and specialty draft beers are in the works for 2013. · The Taproom: The Brewery and Taproom will continue to operate, serving as a key place for the Portland community to connect with the Portland Brewing team. Consumers can continue to expect great beers and food, daily, along with special tastings, events and more. 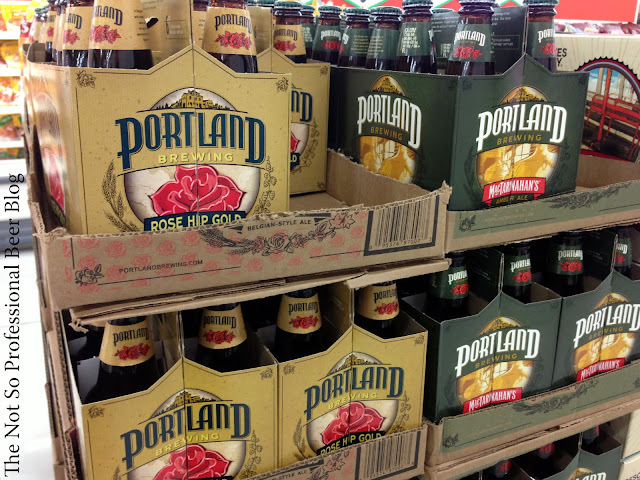 · Timing: Consumers can expect to see beers under the Portland Brewing Company name in February 2013. · Portland Brewing IPA: a new year-round beer. With a darker golden color and some of the most popular citrusy IPA hops, as well as Sterling for a bit of spiciness in the finish, this IPA is hoppy like a Northwest IPA should be. Five different hops and a soft malt backing make for one great, easy-drinking ale. Available in six-pack, 12-pack, 22 oz. bottles and on draft. · Rose Hip Gold: a new spring seasonal that is a Belgian-style ale with notes of fruit and spice and a little citrusy bite from a generous addition of rose hips in the kettle. Available in six-pack, 22 oz. bottles and on draft. · Oyster Stout: the company’s first brew in a new small batch draft program that is exclusive to the state of Oregon. It will feature locally sourced oysters from Yaquina Bay. Consumers will begin to see some of these beers in market as early as Feb. 1. Founded in 1986 by Fred Bowman and Art Larrance, Portland Brewing Company was a pioneer of the Portland craft beer movement. Since opening its doors, the company quickly grew into an important part of Portland’s brewing landscape. The company’s flagship brew, MacTarnahan’s Amber Ale, was first introduced in 1992, earning gold at the Great American Beer Festival. It remains one of the company’s most popular brews today. Driven by a love for brewing great beer for the people of Portland, OR and beyond, Portland Brewing Company is committed to delivering great beer, all the time. From unique small batches, to seasonal brews and new year-round offerings, beer drinkers can expect variety, innovation, quality and great-tasting beer in 2013 from a company that, simply, brews with a passion for beer. Description: "You have in your hands a devastatingly fresh double IPA. While freshness is a key component of many beers - especially big, citrusy, floral IPAs - we've taken it further, a lot further, in this IPA. You see, we specifically brewed it NOT to last. We've not only gone to extensive lengths to ensure that you're getting this beer in your hands within an extraordinarily short window, we made sure that the Enjoy By date isn't randomly etched in tiny text somewhere on the label, to be overlooked by all but the most attentive of retailers and consumers. 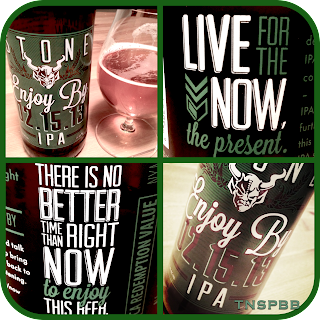 Instead, we've sent a clear message with the name of the beer itself that there is no better time than right now to enjoy this IPA." 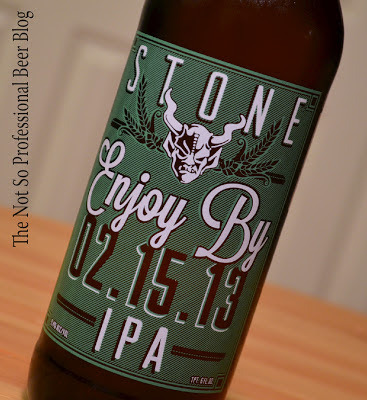 — Stone Brewing Co.
"The beer is bottled on day one, shipped on its own truck to Columbia (local distributor) on day 2 and by day 5 it needs to be in the accounts (1/15/13). Then 30 days later, on the day the label says the beer has expired, it is no longer fresh and must be pulled (and dumped) from all bars and retail spots if still around." The tasting: Golden in color, clear, with a frothy white head that dissipates slowly. Plenty of lacing covers the glass. It has a very fragrant aroma that's full of tropical fruit. I noticed mango, guava, tangerine, as well as some pine. Flavor starts with caramel malt and an alcohol kick. Then the onslaught of hop bitterness ensues. It’s predominately grapefruit and the level of bitterness is quite high. If you're looking for balance, move along. Malt sweetness is low. Enjoy By IPA is light bodied, has an effervescent mouth feel, and finishes very dry with warming alcohol and (as you might expect) a long lingering hop bitterness. It was difficult to identify the hop flavors in the finish. Thirteen hop varieties were used in this beer. Let’s just say they unite to create a newly discovered form of bitterness. Rating: 4 star. Really Good! I want this again! Even if you don't drink beer (which is doubtful since you're reading a beer blog), I suggest you smell Enjoy By IPA. Take a few long sniffs and then give it to a beer drinking friend. The hop aromas are incredible! I'm amazed by the wide variety of aromas that hops can produce. From an educational standpoint, I'm very curious about how the hop aromas and flavors would degrade over time. Although it might make a good experiment, it's not worth angering the beer gods. So best to Enjoy By MM.DD.YY! 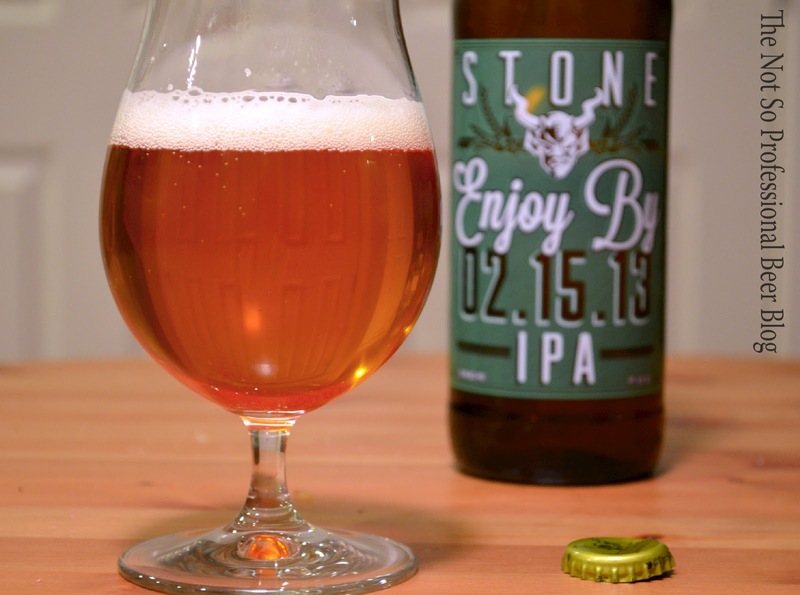 Have you tasted Enjoy By IPA? Hellshire III is a Foreign Stout. How is it different from other stout sub-styles? Matt Van Wyk: Hellshire III is a foreign style stout because it doesn't fit in any other stout style guideline. I was originally making a 'big stout' to try to recreate Heart Shaped Box with cherries and cocoa nibs and vanilla beans. That plan changed, but the beer recipe stayed the same. When it didn't ferment as low as anticipated, it wasn't quite a Imperial Stout and it certainly wasn't a Dry stout. The hops weren't enough for an American Stout. I did use cocoa nibs in the whirlpool, so is it a chocolate stout? Since foreign style stouts sort of fall in the middle of all that (at a range of 6-9%) I felt like that most typified this beer. In reality, I hate to talk about the base beer, but I know people need a reference point to start from, so that is why it is advertised that way. For those that don't know, Foreign style stouts were also known as 'export stouts'. Stouts that had a slightly elevated alcohol level to help to preserve quality in long shipping and storage situation. It's somewhat like the IPA and Imperial Stout stories, alcohol preserves. So add more, it lasts longer. 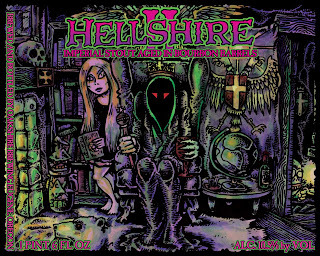 Hellshire II was an Imperial Stout. Like Hellshire III, it was also aged in Bourbon Barrels. Can you compare and contrast the two vintages? 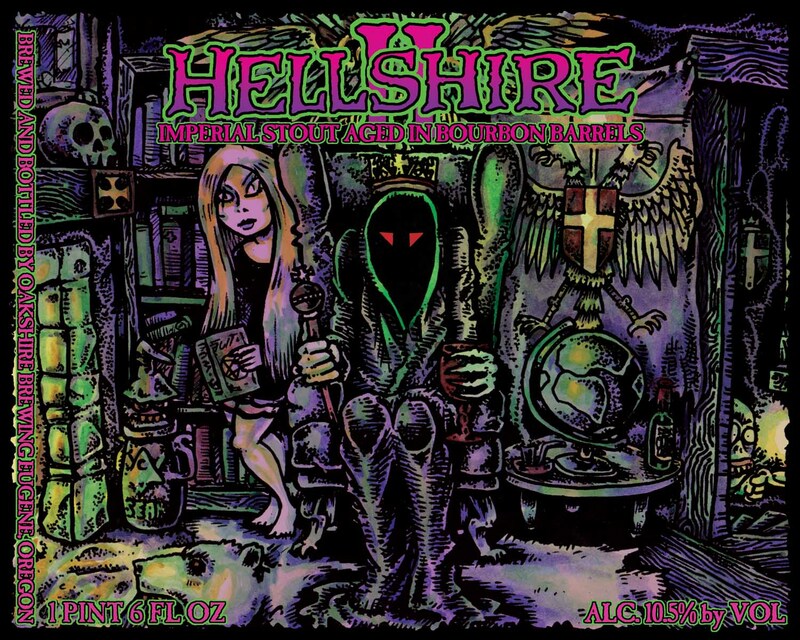 MV: Hellshire II was a bigger stout and the barrels, while bourbon, were different as well. II was aged 1/2 in newly emptied Buffalo Trace Barrels and 1/2 in Heaven Hill bourbon barrels that previously held Hellshire I. III is aged 100% in newly emptied Heaven Hill bourbon barrels. (When I say newly emptied, I mean emptied of Bourbon). I never was completely satisfied with the base beer in Hellshire II. The body was a little thin and I don't think it held up well to the strong Bourbon flavors. Hellshire III is a full bodied stout with a manageable alcohol level that makes it super easy to drink. We'll serve it in a snifter, but I could probably drink this by the pint glass. I thought Oakshire handled the Hellshire II lactobacillus situation very well. What did you learn from the experience? MV: We certainly did learn a lot from Hellshire II. Bottom line is we stand behind all the beers we make and when we make something that turns out infected (on accident), we won't stand for a customer having to pay $15 for our problem. Instead, we took the hit. We fully understand that when we push the envelope, there are risks involved. Beer spoilers are a concern and while we take care to keep them away, these things happen. I know from my point of view, I learned to just leave the beer alone and let the barrel do its magic. There are a lot of things I tried to do to improve the base beer that I didn't care for on Hellshire II and it seems I might have tried too hard and introduced the bacteria. Or, perhaps it was an individual barrel that we blended into the mix. In the past, we only went by sensory analysis. Now, I am sending samples to Widmer Brothers Brewing to assure that the beer is clean. The preliminary results on Hellshire III were negative for any spoilers and I have bottles being tested as we speak. I should know those results any day. Widmer has been great about helping us out. Have you tasted Hellshire I recently? How is it evolving? MV: Hellshire I tastes even better now than at the release. Some of the criticisms included being too dry, bitter, and harsh. It was a barleywine and it was 100% barrel aged, so it was aggressive. People were looking for that overly sweet oxidized barleywine. Now it has aged and softened and become quite a good barrel aged barleywine. What’s in store for Oakshire in 2013? MV: 2013 is going to be a crazy year for us. The Press releases are coming out soon to explain it all, but On Jan 29th, I take possession of our 6th and 7th 80 barrel fermenter. In February, we get our canning line. We should be shipping 12 ounce cans of Watershed IPA in early March. Then we get a centrifuge in mid-March. All of this expansion, including opening the new Oakshire Public House this spring (which will allow us to do that equipment install and expansion) will allow us to make up to 17,000 barrel in our current plant. We hope to make over 9,000 barrel in 2013. So, a lot is going on at Oakshire. I'm looking forward to seeing Watershed IPA in cans. Will we see more Oakshire beer in cans? MV: Yes, there will be more out, but not sure when. Still a debate on which beers though. Maybe something new??? A huge thanks for Matt for taking the time to chat! It looks like Hellshire III will be the best yet! The only question is should I drink it as soon as it's released? Or should I cellar it? I expect the correct answer is both! Eugene, OR (January 10, 2013) – Oakshire Brewing will release their third Barrel Aged Beer under the label Hellshire on Saturday, February 16th. Hellshire III is a Foreign Style Stout aged for nearly a year in bourbon barrels from Heaven Hills Distillery in Kentucky. Sales of the 22oz wax dipped bottles will begin at 10am in the tasting room on Madera Street during the Oregon Brewers Guild Zwickelmania event. In November 2012 Van Wyk attended the Festival of Wood & Barrel Aged Beer in Chicago, IL; a single barrel version of Hellshire III was entered and won the gold medal. During the Hellshire III release party on February 16th, Oakshire will also sell vintage Brewer’s Reserve Series beers and Hellshire I in very limited quantities. Other specialty barrel aged beers will be available on draught throughout the day. Live music will be provided by local bluegrass band Whiskey Chasers and food will be available for purchase from Delacata – voted Best Food Cart of Eugene 2012. Hellshire III will be sold at Oakshire Brewing during dock sale hours starting on Saturday, February 16 from 10a-5p. The 22oz bottles will sell for $15 each and supplies are limited to roughly 140 cases. Oakshire Brewing of Eugene, OR, was founded in October 2006 with the goals of brewing the highest quality craft beer while providing exceptional customer service. Oakshire has become regionally and nationally recognized for consistently brewing fresh, unique and delicious beers in Oregon’s lower Willamette Valley. The name Oakshire represents our core values: Strength, like the enduring oak; Independence, which fuels our innovation; and Community, remembering our place within the whole. The brewery is located at 1055 Madera Street, Eugene, OR. Learn more about Oakshire Brewing, our craft beers, brewery events, tours and tastings at http://oakbrew.com. Description: "After a long day on the mountain carving turns in deep powder, snowboarders and skiers make their way down the mountain to warm up and relive all those great runs in our pub. Our British style nut brown ale helps fuel the stories of deep powder and epic yard sales. The combination of 2 row pale, crystal and chocolate malts impart an array of malt and chocolate flavors in a medium bodied ale with an extremely smooth palate. Fuggle and Mt.Hood hops contribute a slightly spicy aroma and finish to complement this beer’s malt character." 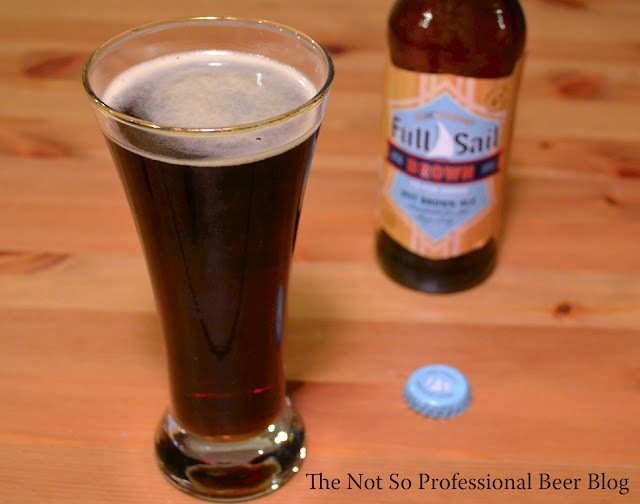 — Full Sail Brewing Co.
Random thoughts: Full Sail recently announced Pub Series, their new line of rotating beers. Nut Brown is the first release and will be available through the end of March. I'm drinking this as part of my upcoming series on Spring seasonal beers. The tasting: Dark brown in color with reddish hues and an off white head that dissipates fairly quickly. Aroma of roasted malt, coffee and vanilla. Flavor starts with roasted malt. In the middle, cocoa comes through along with a light brown sugar sweetness that is balanced by a moderate herbal and earthy hops bitterness. Nut Brown Ale is light bodied, softly carbonated, and has a smooth mouth feel. It finishes with roasted malt and subtle hints of yeast. Rating: 4 star. Really Good! I want this again! 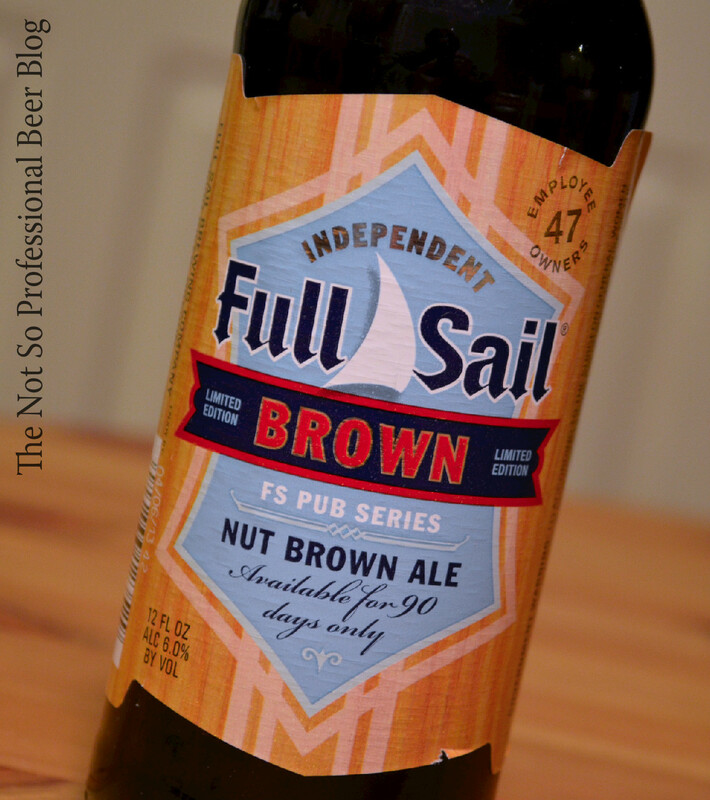 I'm glad Full Sail released Nut Brown as part of their new Pub Series. It's a solid beer and I could easily see myself drinking a few of these. Have you tasted Nut Brown Ale? Description: "ReNEWale Extra Special Bitter has smooth caramel malt notes upfront and fruity esters contributed by the yeast. 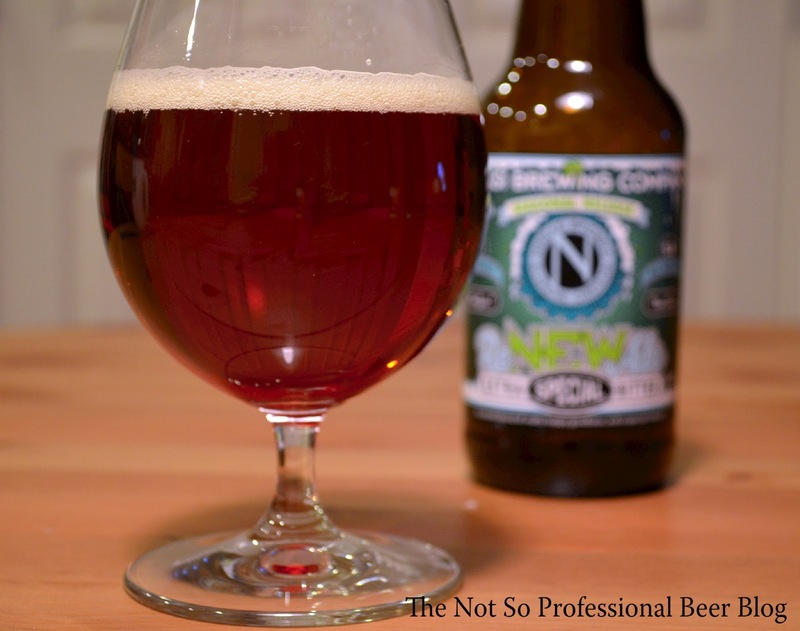 Kent Goldings and Northern Brewer Hops add a deep earthy and grassy hop flavor and aroma. Extra special! Extra balanced! Extra tasty!" 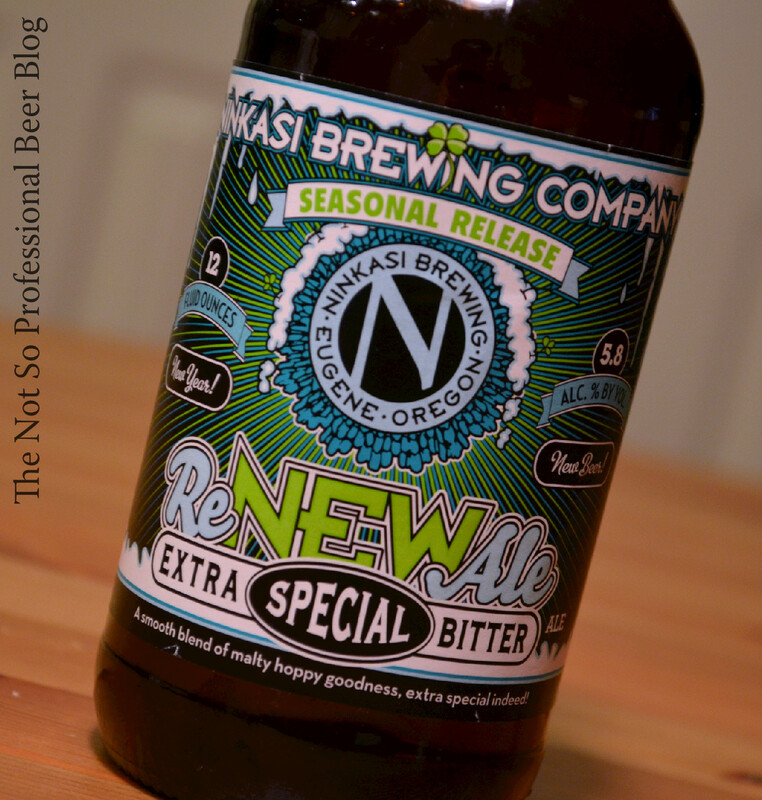 — Ninkasi Brewing Co.
Random thoughts: Each January, Ninkasi kicks off the New Year with a brand new beer. In recent years, the Renewale series has brought us a Porter in 2012 and Mason's Irish-Style Red Ale in 2011. This year, it's an ESB. It's been a while since I've tasted the style, so this will be a welcome change of pace. 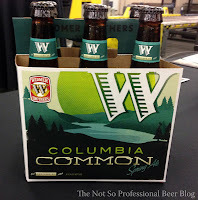 Until recently, Widmer Brothers' W' series served up a new beer each January, but that series was shelved to make way for a new spring seasonal. I'm glad Ninkasi has continued the "new beer" tradition, and hope they keep the series going long into the future. The tasting: Copper in color, clear, with an off-white head dissipates fairly slowly. Aroma of caramel, grass, and herbal notes. Flavor mirrors the aroma with the addition of biscuit malt. It has some light malt sweetness, but is nicely balanced overall. Alcohol is not present in aroma or flavor. Renewale ESB is light to medium boded and moderately carbonated. It has an effervescent mouth feel and and finishes with caramel and a long lingering earthy hop bitterness. Rating: 3 star. Good. I would drink this again if someone gives it to me. Cheers to Ninkasi for giving us an ESB this year! I wish more breweries released ESBs. Besides Redhook, I can't think of another NW brewery that produces the style year-round. Anyway, if you haven't had an ESB in a while, give this a try. The only reason I didn't rate it higher is that I'm not a big fan of grassy hop flavors—but that's just my personal preference. Have you tasted Renewale '12 Extra Special Bitter? Who makes your favorite ESB? Review: Smooth Ryed, BridgePort Brewing Co. Description: "Beer's a journey, not a destination. Each sip of Smooth Ryed's toasty malt flavor is worth savoring. With a pound of Centennial hops per barrel and a hint of spicy rye character, you're sure to enjoy the ride." 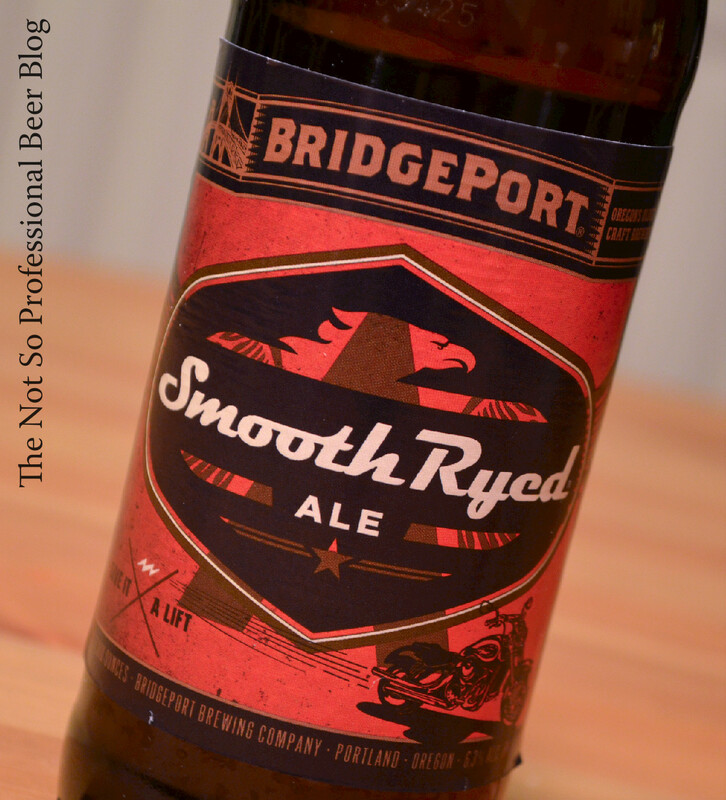 — BridgePort Brewing Co.
Random thoughts: Smooth Ryed is BridgePort's new spring seasonal. I shared the beer's press release a few weeks ago. I'm drinking this as part of my upcoming series on Spring seasonal beers. The tasting: Light amber in color, clear, with a white head that dissipates fairly slowly. Aroma has light floral notes along with some soap. Overall, it isn't particularly inviting. Flavor starts with caramel and spicy rye. Grapefruit and earthy hop bitterness emerge in the middle. Alcohol isn't noticeable in aroma or flavor. Overall hop bitterness is moderate. Smooth Ryed is medium bodied and finishes with very slight tart twang, grapefruit hop bitterness, and a mild soapy flavor. Rating: 3 star. Good. I would drink this again if someone gives it to me. I'm not entirely surprised by the soapy aroma and flavor. I once made a homebrew Rye Pale Ale that had similar soapy notes. I've tasted a similar flavor in some, but not all, of the rye beers I tasted. However, it does have the tangy and spicy rye flavor that I enjoy in the style. 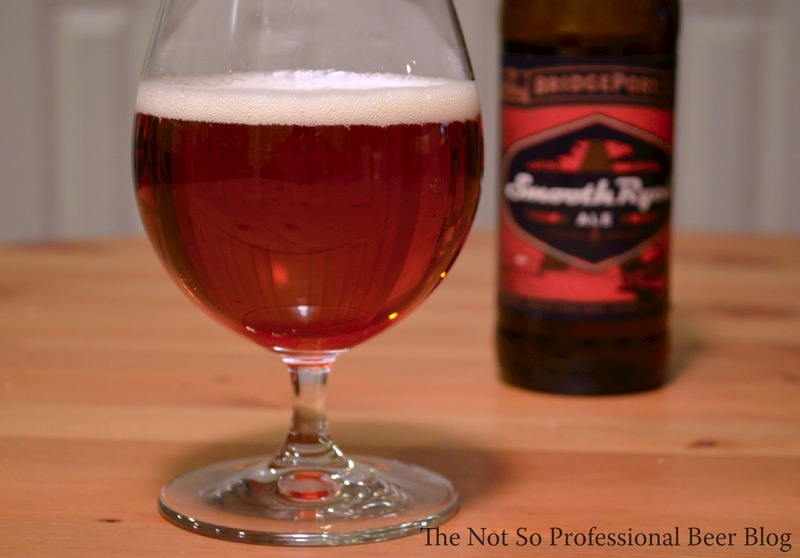 If you like beers with rye, or are curious about the style, give it a try. Have you tasted Smooth Ryed? What's your favorite beer with rye? 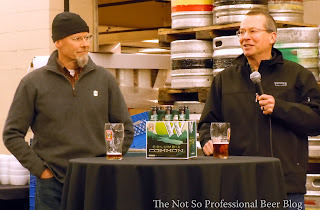 On Monday evening, I attended a beer release event hosted by Widmer Brothers Brewing Co. It was a busy evening, as not one—but five beers were introduced. You can read the details about each in the press release below. Instead, I'll highlight some of the changes. 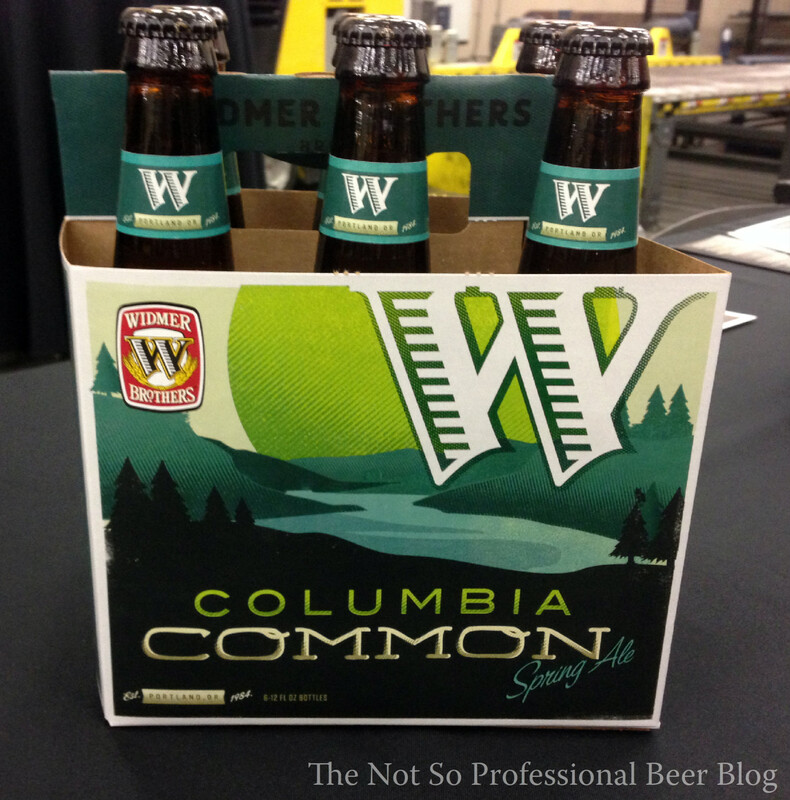 First, you'll notice Widmer's new branding and graphic design. I first reported on this back in September. I was never a fan of the cookie cutter design that was launched in March 2011. Anyway, I love the new look! Third, the Series 924 Beers have been rechristened as the "W Series." Besides the name, nothing else is changing. Nelson Imperial IPA and Pitch Black IPA will be released year-round. A third beer will be a rotating selection. Expect to see the return of Marionberry Hibiscus Gose later this summer. The last rotating 924 release was Milk Stout. If you haven't tasted Milk Stout yet, get some before it disappears. Anyway, I expect the new W Series will continue to launch the innovative brews that were previously released under the old W' release. If you're confused, don't fret—good beer will still be available. Finally, the Alchemy Project is gone—sort of. The beers released in this series (which include Brrrbon and Raspberry Russian Imperial Stout) will now be part of the Brothers Reserve Series. I loved Alchemy's vertical release concept and am glad it will continue. Expect to see an increase in the number of Brothers Reserve releases, to the tune of 7 beers in 2013. There are no changes to the popular Rotator IPA Series. O'Ryely IPA will soon make a second appearance. Widmer has launched quite a few different initiatives during the past few years, and these changes will simplify their offerings from a marketing perspective. 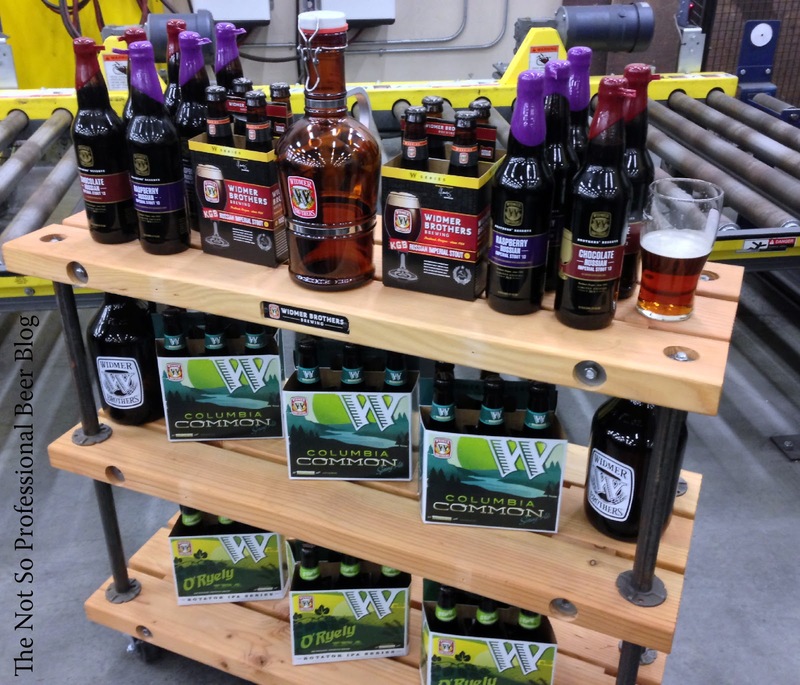 However, I expect Widmer Brothers will continue to be one of the most innovative CRAFT breweries in the country. 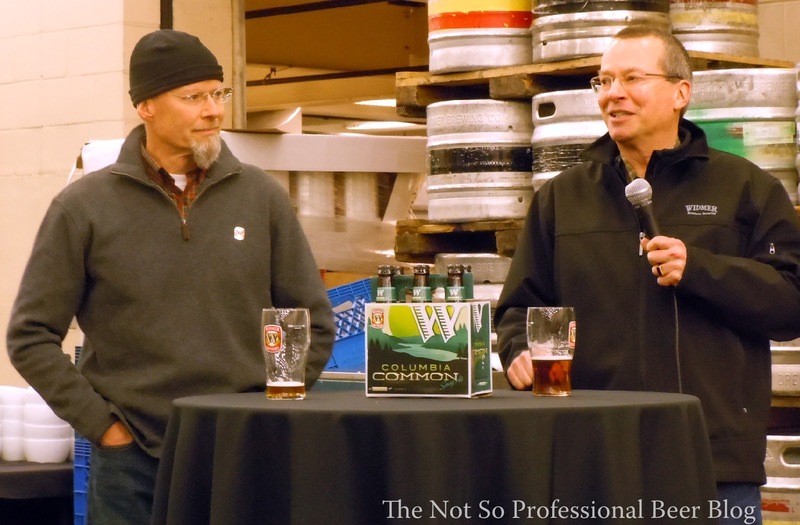 PORTLAND, Ore. – Jan. 15, 2013 –Widmer Brothers Brewing is celebrating the start of a new year with five new beer releases and some bold new packaging updates. The releases include two brand new Widmer Brothers beers: Columbia Common Spring Ale, the new recurring spring seasonal from the brewery, and Chocolate Russian Imperial Stout ‘13, a version of KGB Russian Imperial Stout brewed with Ecuadorian cocoa nibs. Additionally, three fan favorites will return as part of the brewery’s spring lineup: O’Ryely IPA, KGB Russian Imperial Stout and Raspberry Russian Imperial Stout ‘13. What started as a dream for two ordinary brothers who just loved beer has now become a reality for two ordinary brothers who still just love beer. Kurt and Rob Widmer helped lead the Pacific Northwest craft beer movement in 1984 when, in their 20s, they dreamed of brewing unique interpretations of traditional beer styles. In 1986, Widmer Brothers Brewing introduced the first American-style Hefeweizen; today, the unfiltered cloudy beer is the company’s signature brew and one of the best-selling wheat beers in the country. Based in Portland, Ore., the brewery currently brews a variety of beers including its Rotator IPA Series, Drifter Pale Ale, Pitch Black IPA, Nelson Imperial IPA, a high-end Brothers’ Reserve Series and a full four seasonal lineup. For more information about Widmer Brothers Brewing, visit www.widmerbrothers.com. Review: Durty, Smuttynose Brewing Co.